Metsamor faces an uncertain future.. 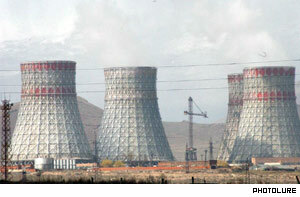 The EU has so far offered to pay only 100 million euros ($123 million) to finance the plant’s decommissioning. The bloc and its member states point to Yerevan’s past promise to shut it down by 2004. They say Armenia’s mountainous territory is too earthquake-prone to have safely operating nuclear plants. Yerevan insists that the proposed financial grant is nowhere near enough to substitute for the Soviet-era facility that meets about 40 percent of the country’s energy needs. “They say that they will give $100 million. But it is impossible to close the atomic station and create alternative sources [of power] with that money,” Prime Minister Andranik Markaryan said in separate comments. However, Markaryan made no mention of a new nuclear plant when he listed possible alternatives to Metsamor. He spoke in particular of the need to use Armenia’s great potential for hydro-electric power generation. He stressed the importance of a big hydro-electric power plant which Armenia plans to build jointly with neighboring Iran on the Arax river separating the two countries. The government also intends to build dozens of small plants across the country which is rich in fast-flowing mountainous rivers. Officials say a state-owned German bank, KfW, is expected to provide 30 million euros in loans for that purpose next year. Markaryan and Movsisyan spoke to journalists during a visit to the eastern Gegharkunik region for the official inauguration of a new major electricity transmission station built there with KfW’s financial assistance.